Eagle "Pro Bundle" Edition for Android® - Now Shipping! Wireless network router (for sync). Wi-Fi access to Windows PC (for sync). Awarded "Best Product of the Year" the IntelliGolf® software is perfect for use on Android-based smartphones running OS 2.2 or higher (e.g. 3.x-4.x) and virtually any Windows-based PC! The IntelliGolf Eagle "Pro Bundle" edition version 11.x software includes our latest 1) IntelliGolf Eagle "Smartphone" edition software for Android ($3.99 Special / List: $29.99), plus our latest 2) IntelliGolf "Birdie" edition desktop companion and synchronization software ($14.99 Special / List: $39.99) for Windows-based PCs. The IntelliGolf Eagle "Smartphone" edition software provides "on course" golf scoring for up to five players (i.e. fivesome), track shots for every club, and allows you to view distances from tee-to-green using the GPS chip in your smartphone. The Birdie edition software features our powerful a) Windows-based PC "golf trends and charting" software, b) Wireless synchronization software, and c) Cloud-access software to our golf course server (DB) of over 27,000+ courses worldwide. It's the perfect combination of features for customers that want to automate golf scoring and wagering, evaluate performance statistics and graphs, and track shots and view distances with GPS accuracy. Stay on top of your golf game with the IntelliGolf Eagle "Pro Bundle" software! Note: While most golfers get the full Eagle "Pro Bundle" software, if you are interested in the IntelliGolf Eagle edition "smartphone only" software, please click here. It's on Special for only $3.99 (List: $29.99). Sharing/exporting rounds to the web. BTW - IntelliGolf has been used by hundreds of thousands of golfers worldwide including college and high school teams, PGA, EGA, RCGA golf professionals and their caddies in 125+ countries worldwide! Use the included IntelliGolf Eagle "Smartphone" edition software to automate golf scoring for up to five players (i.e. fivesome) on the course. Track shots for every club including hybrids. Survey and view distances from tee-to-green using the GPS chip in your smartphone. Evaluate game-improving statistics and graphs. IntelliGolf will even add up your group's wagers using any of the included sidegames (e.g. skins, birdies, stablefords, etc). The IntelliGolf Eagle edition includes the ability to view distances from tee-to-green with GPS accuracy using the GPS chip in your Android-based smartphone. IntelliGolf will provide you with GPS distances from any location on the hole to the 200, 150, 100 yard/meter markers, to the front, center, and back of the Green, and up to three (3) custom fairway locations (e.g. sand trap, dog-leg, creek, etc) for GPS-enabled courses. Club selection has never been easier! IntelliGolf includes the ability to enter your official USGA Handicap Index, EGA Index, Handicap (e.g. RCGA), or approximate a handicap for you. Under license from the USGA®, IntelliGolf will convert your official Handicap Index to a Course Handicap based upon its Slope® rating. At the end of your round, IntelliGolf will automatically compute your Adjusted Maximum Score (using ESC) for posting. No more charts and tables. IntelliGolf does it for you! As an IntelliGolf Eagle "Pro Bundle" edition customer you will also receive our powerful IntelliGolf "Birdie" edition Window-based "desktop companion" software. It will let you wirelessly synchronize (via WiFi) all of your rounds, courses, and players to your PC for viewing cumulative round statistics, charts, graphs, and more. Using your Internet browser and the IntelliGolf version 11.x software, you will also have free upload/download access to thousands of signature courses, including their digital scorecards, for use with the IntelliGolf Eagle and Birdie edition software. Now you will be able to upload/download your favorite courses for all IntelliGolfers to share. Manual scorecard entry is a thing of the past with IntelliGolf. If your favorite course has not been GPS-surveyed by a fellow IntelliGolfer, the IntelliGolf software includes the ability to easily enter GPS coordinates using our new survey feature. Now you can use popular Earth Viewers (e.g. Google Earth) to pinpoint and enter GPS coordinates into the IntelliGolf software, in the comfort of your own home, for many target destinations (e.g. 200, 150, 100 yard/meter markers) and obstacles (e.g. and traps, creeks, trees, etc). Once you're on the golf course, the IntelliGolf software will provide you with GPS distances to all of these points using the GPS chip in your Android-based smartphone. Plus, IntelliGolf's new Auto-Fill feature will save you up to 75% of the keystrokes normally required to enter a new course. This is "Cloud Computing" at it's best! The IntelliGolf Birdie edition software will track cumulative round statistics, display charts and graphs on your progress, print scorecards, and export round results in HTML format for posting to the web. In full color, view trend lines showing how your total score relates to putting, driving, and to greens hit in regulation. Now you can quickly spot areas of improvement and areas for improvement. Note: For information/requirements on how to set-up "wireless synchronization" for the Eagle "Pro Bundle" please click here. Join golfers in 125+ countries worldwide that are using IntelliGolf to improve their game and increase their winnings. 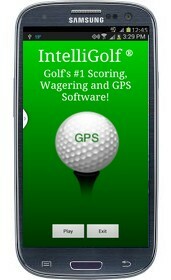 IntelliGolf -- Golf's #1 Scoring, Wagering and GPS Software! Get it today. To install the IntelliGolf "Pro Bundle" sofware onto your Android-based smartphone and Windows-based PC, please click here to view our on-line Quick Start Tour. It will show you how to install IntelliGolf onto your smartphone and desktop, how to download courses, enter players, and how score your rounds using the IntelliGolf software. Or, you can just give it a whirl... You should find everything every intuitive with the IntelliGolf software! Note: We also have a lot of great FAQs on loading/installing/using IntelliGolf on Android smartphones by clicking here.